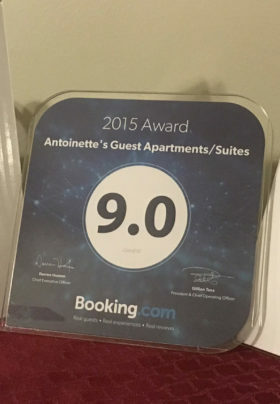 Antoinette’s Apartments & Suites offers welcoming accommodations for Cape May Beach vacations. When you visit, you’ll likely notice the beautiful, detailed handiwork in the many dollhouses, models and lampshades throughout the Inn. The origin of these finely crafted pieces is a large part of the Inn’s unique recent history. During the winter of 1996, Deanna was joined by her 80 year old father Fred who only planned to stay the winter. Well, Fred stayed 7 years. To keep himself busy he built his first wooden boat model in the winter of 1996. 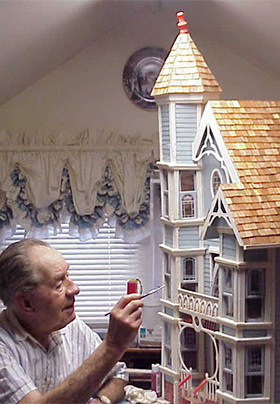 The guests loved the ship and appreciated the workmanship of this senior citizen, and Fred expanded his repertoire to more ships and dollhouses of all kinds. During the summer of 1999, the models were moved to the front porch for the summer visitors. These dollhouses became a stopping point for the visitors passing by the house, horse and buggies and the Cape May trolleys. It’s wonderful that he found a way to share his senior years with our guests. Besides the priceless boats and dollhouses, there are many treasures to be enjoyed throughout this historic house. Most of the house’s 70+ windows have handmade curtains and draperies. And don’t miss the 40,000-stitch hand filet crochet wall hanging of The Lord’s Prayer, completed by Antoinette at age 94: six months before she died. This two-year-project masterpiece was awarded a blue ribbon. Deanna, our innkeeper, is a direct descendant of the talented Antoinette and takes after her grandmother’s meticulous attention to crafting. Deanna is self-taught and has learned many skills from the fine art of making Victorian lampshades, to restoring antique furniture, some of which can be seen throughout the Inn. Come see 20+ handmade Victorian-style lampshades skillfully made from silk, brocade, and recycled wedding dresses. If you think you’d like to learn this craft yourself, Deanna is an acclaimed seminar instructor for this nearly lost art, and offers a live taping of her seminar for viewing or sale: Cape May’s Victorian Lampshades: Recreation of a Lost Art.